Stitchers Anon: Oh Christmas Tree! Hi Folks, how are you all? It has been a mixed week here and frankly I will be glad when it is over. I have found another lump. The hospital are being very good and are getting me in on Tuesday. I am trying to remain focused on the fact that at the moment it is just another lump. And a lump can be anything...it is what it is and it is just a lump until I know differently. Prayers again are much appreciated but gosh darn it, I am soooooo fed up with lumps! Now; several things for this post. Firstly can I introduce some new friends. They have amazing blogs but less than 100 followers...can we help change that perhaps? The Second is a great little blog: the writer is just returning from a break and would love for you to say hi! Stress Less Stitching is the name of the blog and is really appropriate lol. Isn't that why we all stitch? Secondly, I want to say thank you to Noemi over on Wagapapa CreationsWagapapa Creations. Noemi is in Spain and kindly emailed photos of her finish of Boo-tiful in Black. Wow..such a boost for my confidence. And yesterday I had a chart request from Japan! How exciting that my charts are travelling so far. I wish I was with one of them! I could do with some sun and escapism! Thank you to all of you for your support and encouragment. I am having a ball! Now, a few days late (sorry), but here it is. Part six of the Christmas SAL. You are nearly done now. Christmas trees are originally a German custom. When Queen Victoria married her knight in shining armour, Albert, Albert brought the tradition to England. 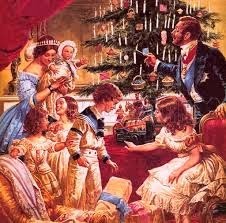 Trees were originally decorated mainly with candles but in later years with home made decorations and small gifts. Little teacups and ornaments. Yup: candles...not too sure how they would go down with today's health and safety issues but I guess in the dark and dreary winter months in Victorian England, anything with brought light and hope would have been much appreciated! So here without further delay...part Six. Have fun and see you soon with Part Seven! And finally, I would just like to wish all our American bloggers a very happy Thanksgiving. We may not all have what we want, but most of us have what we need and for that I am thankful. Happy Thanksgiving and I am sure that your lump is just what you say - a lump and nothing else! My thoughts and prayers are with you, my dear. I am praying you get good news next week. Hopefully the lump is nothing to worry about. Hang in there Gaynor! At least your stitching and designing is keeping you busy. Good for you! Thoughts and prayers headed your way....so glad you have found such satisfaction in spreading your designs!! I'm off to check out a new blog or two! I am way behind in reading blogs, so didn't know about this new lump! I will now pray that it be taken away or if left, be nothing! Too much soda or chocolate! Big Hugs! Goodness, I missed this post! Praying for you that this lump is nothing in the grand scheme of it all.